Over 30 million Americans in 15 states are under weather alerts on Sunday as hazardous conditions await on one of the busiest travel days of the year. Flight delays and cancellations are likely across the Midwest, as major cities from Kansas City, Missouri, to Chicago will see heavy snow, and possible blizzard conditions in some spots. 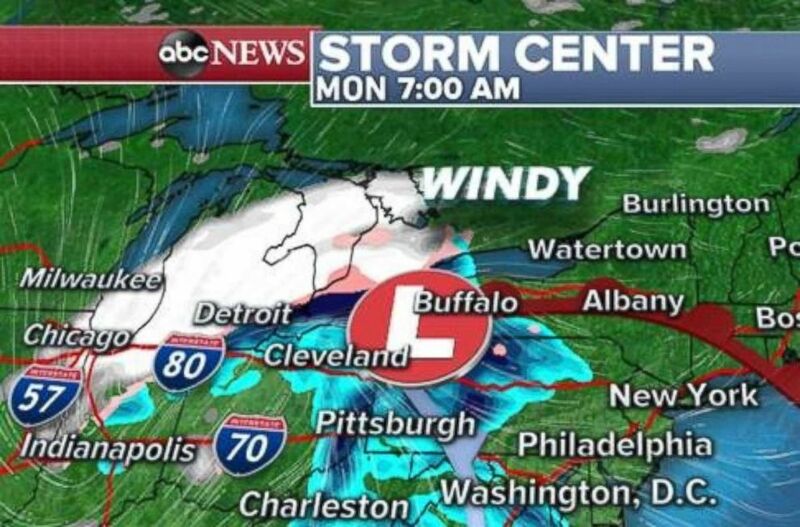 Winter storm and blizzard warnings are in place as a major storm moves through the Midwest on this busy travel Sunday. A winter storm warning is in place for the Chicago area, while blizzard conditions are possible near Kansas City, Missouri, on Sunday. Kansas City is under a blizzard warning due to an expected 4 to 9 inches of snow and wind gusts up to 50 mph on Sunday. The last time the Kansas City metro area was under a blizzard warning was in 2011. Chicago is under a winter storm warning, with 3 to 6 inches of snow possible along with gusty winds. Heavy snow is falling Sunday morning in parts of Nebraska and Kansas, with it eventually moving into Iowa. Strong winds will combine with heavy snow to create whiteout, blizzard conditions in some areas. Snow will move into the Kansas City, Mo. ; Des Moines, Iowa; and Chicago areas on Sunday. 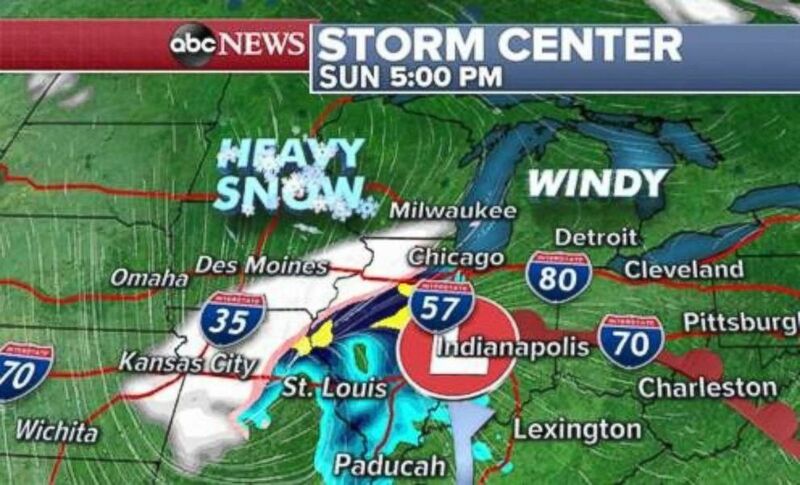 The storm is moving rather quickly — by Sunday afternoon and evening it will move into Kansas City, and eventually into northern Illinois and southern Wisconsin. The heaviest snow in Chicago will hit around 5 p.m. Sunday evening through 5 a.m. Monday morning. The combination of heavy, wet snow sticking to trees and power lines could result in widespread power outages. Snow will still be falling in Chicago and all of Michigan by the Monday morning commute. 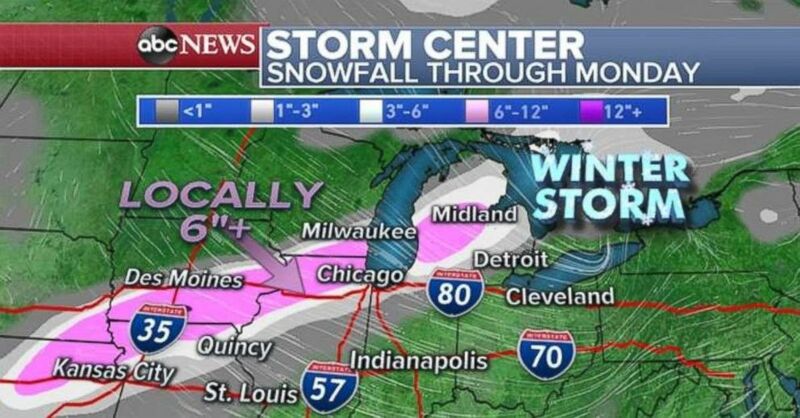 Snow lingers in Chicago on Monday morning and will continue to fall heavily across Michigan. The storm itself will then move into the Northeast, but thankfully it will be mostly rain in the region due to the milder air mass. Some areas of heavy rain are possible from New York City to Boston for the Monday evening rush, but any wintry precipitation will be confined to northern New England. 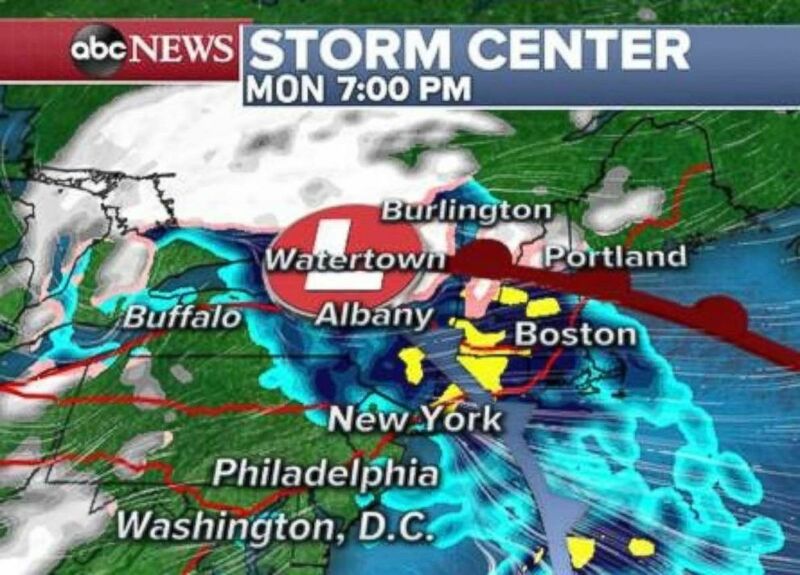 The precipitation will fall as rain from New York City to Boston on Monday evening. A swath of 4 to 8 inches of snowfall is possible from Kansas to Michigan, with over 10 inches possible in some spots. The largest snow totals, possibly over 6 inches, will likely be just outside of the major Midwest cities: north of Kansas City, south of Des Moines, Iowa, and northwest of downtown Chicago. Snowfall totals will be heaviest from Kansas City, Mo., to Chicago. Regardless, heavy snow and strong wind gusts of 30 to 40 mph will bring near whiteout conditions and extremely hazardous travel on this very big travel day. I-35 and I-80 will both be affected and anyone getting on the road in these areas should be very careful of blowing snow and dangerous roadways.